The latest story to find itself added to the growing number of successful implementations of Scalefree’s services, and Data Vault 2.0 as a whole, centers around a sector known for its strict regulatory bodies in addition to high volume of data that demands the utmost in terms of privacy and security. As the events that unfolded during the various financial crises at the start of the century left governments the world over seeking to impose stricter regulations for the financial sector. Banks within the sector were faced with a new task as they sought to continue operating with expansion in mind while still falling well within defined standards. One such organization, Berenberg, a centuries-old private bank operating across oceans and within several major financial sectors, found the demands of governments’ regulatory bodies provided a challenge in leveraging BI across the organization. And as such, the organization found itself in a unique position in which standard methods of the task left something to be desired when building a fully functioning yet fully auditable collection of data, especially when considering the disparate sources of such data. So, to both meet the expectations of the organization while still abiding by the various regulations put in place by each government within the borders of the bank’s operation, Berenberg turned towards Scalefree. Tasked with the challenge of building a system in which disparate sources of data, as well as various formats of data, could be accessed, utilized, and audited from a single point, in addition, to be available to the organization as a whole, Scalefree began working to develop a solution in which the standards of Data Vault 2.0 completely meet those demands while still offering an applicable BI solution. Setting out to create a two-part solution, Scalefree first approached the task by building a controllable dashboard in which users within the system could access and utilize the data collected throughout the organization without the inherent problems found within the previous system, that being a system that relied upon stored data and spreadsheets kept locally within hard drives or local networks. Doing so, Scalefree was able to provide a uniform platform in which the entire organization, regardless of location, could contribute to as well as utilize the collected data in a way that still maintained the needed privacy of involved parties. No easy task in itself, once the platform’s dashboard was built, the real work began. As the main challenge faced in building an applicable BI solution for the organization laid within the strict regulation it faced, the entire system, including the stored data, needed to be fully auditable and able to report accurate information on a predetermined basis to furnish reports to the bodies responsible for oversight. With other solutions, Berenberg found this task not only daunting but also requiring the use of a significant of manpower as the report making necessitating employees formatting data, sometimes in a raw state, into a readable format for those tasked with ensuring the organization’s operations were to standards. Though as is the standard protocol of Scalefree’s team, the solution employed found a way to not only meet the expectations of the regulatory body, in terms of readable reports but also allow Berenberg’s teams to leverage collected data in a meaningful way. Thus creating a solution that fully addressed the proposed problems. The entire process of such being detailed in a technical report worth a read if not for the sheer scale of the project itself. If you are interested in the detailed story please send a request with your contact details to [email protected]. As the partnership between Berenberg and Scalefree adds yet another story to the growing list of successes within the organization, what lies ahead is sure to prove in the same vein. If you’d like to learn how Scalefree can help your business step forward into the future and leverage Big Data for a better quarter, feel free to send us a message or visit our website www.scalefree.com! Join the Scalefree Team, as well as our friends from Wherescape, at our first time attending the Gartner Data & Analytics Summit as we spend two days building the future of data within modern business. Or meet us at this year’s DDVUG conference on 25./26. October in Hamburg! There Michael Olschimke will give insights into the project and show the value of Managed Self-Service BI. 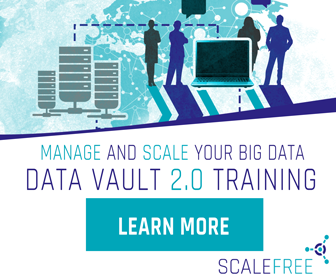 Discover the latest Data Vault 2.0 innovations in the Data Vault 2.0 Upgrade Class 2018 online.